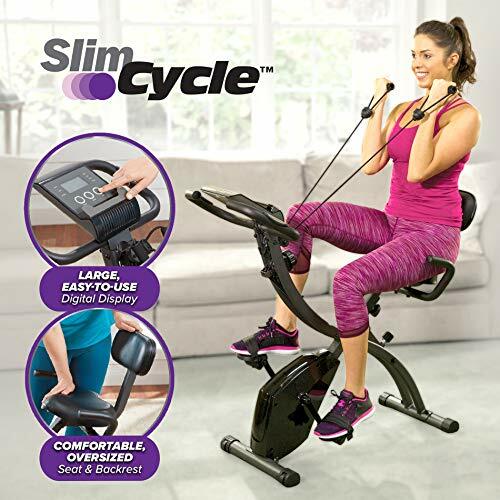 Slim Cycle 2-in-1 Stationary Bike - Folding Indoor Exercise Bike with Arm Resistance Bands and Heart Monitor - Perfect Home Exercise Machine for Cardio by BulbHead at Sweat NY. Hurry! Limited time offer. Offer valid only while supplies last. RECUMBENT EXERCISE SPIN BIKE: offers a low-impact sit and cycle workout that burns calories in a more comfortable position. STRENGTH TRAINING: built-in Arm Resistance Bands allow you to sculpt and tone arm muscles while you cycle. Experience comparable full-body benefits of cardio equipment like the row machine and stair climber. MAGNETIC RESISTANCE: Like other exercise equipment machines, turn up your workout and work your way through 8 levels of magnetic resistance to challenge muscles.